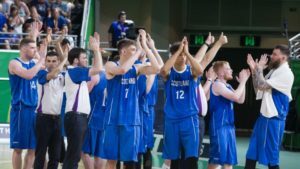 basketballscotland’s social media channels will be taken over on Monday as we celebrate the one year anniversary of Team Scotland’s fourth place finish at the 2018 Commonwealth Games. Memories from throughout the tournament will be shared as Scotland defeated England, Cameroon, India and Nigeria on their way to the semi-finals, where they faced eventual gold medallists Australia, before a third place playoff v New Zealand completed the tournament. A number of new interviews with several of the playing squad – including Kieron Achara, Gareth Murray, Jonny Bunyan and Ali Fraser – will be posted across the day as the players discuss the key talking points of the tournament. Assistant Coach Craig Nicol will also be sharing his memories from a coaching perspective as basketballscotland aims to recognise the achievements of the team and the valuable contributions of all those off the court. Supporters are encouraged to join the conversation on social, using the hashtag #TeamScotGC to share photos and memories from the Gold Coast! Vacancy: Coach Developer Own a Commonwealth Games jersey!